1.1 'The Bloodless Soldier', written by Justin Richards and directed by Lisa Bowerman. Featuring Alex Lowe, John Banks, Robin Bowerman and Alex Mallinson. A group of soldiers return from overseas service - but they have brought a terrible evil back with them. As death strikes on the streets of London, Sergeant Quick calls upon the help of Professor Litefoot while an old enemy lurks in the shadows. 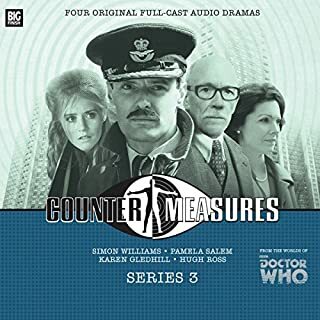 1.3 'The Spirit Trap', written by Jonathan Morris and directed by John Ainsworth. Featuring Janet Henfrey and Lex Shrapnel. Ellie Higson believes that spiritualist Mrs Vanguard can hear the voices of the dead, but Henry Gordon Jago thinks it's all superstition and theatrical trickery. But if Vanguard is a harmless fake, then why have some of those who have attended her seances disappeared so mysteriously? 1.4 'The Similarity Engine', written by Andy Lane and directed by Lisa Bowerman. When Jago takes a tumble on an unseasonably icy road, he ends up in hospital. But this is no ordinary medical establishment, and the patients are suffering from no ordinary illnesses. At last, the fiendish scheme of Dr Tulp is drawing to its cataclysmic climax. 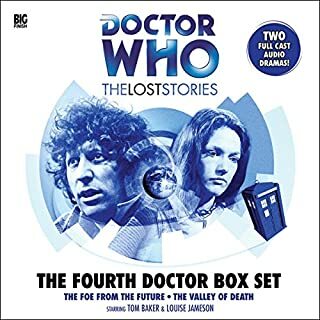 Jago and LLitefoot were two supporting characters from the 1977 Doctor Who story &quot;The Talons of Wen Chiang&quot; which featured TomBaker as the Doctor and Louise Jameson as his assistant Leela. Personally speaking, the Tom Baker era was the golden age of Doctor Who but that's not relevant here and I'm just drifting off into nostalgia again. I had heard rumours that the Jago and Litefootcharacters were going to get their own TV series at one point years back as a spin-off no doubt. They proved to be interesting, endearing and seemingly popular to warrant this and I'd have to agree. 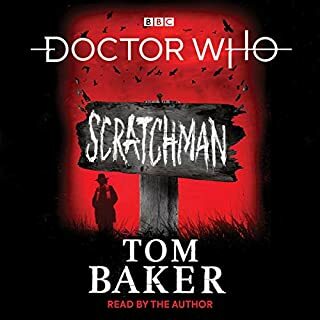 The Victorian London of circa 1888 proved to be an evocative setting for the two unlikely heroes and so it came as no surprise to me to eventually come across this audio series of 4 short stories. My love of that classic Doctor Who episode that introduced these two characters is what immediately made me purchase this book. The first thing that struck me was how each actors voice has remained unchanged after the 30 odd years since their Doctor Who TV appearance. 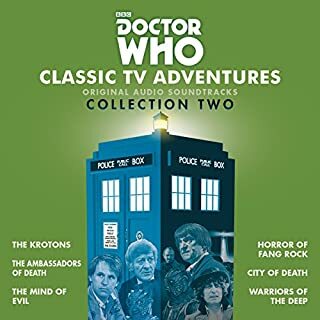 This is in sharp contrast to the terribly aged sounding Gareth Thomas as Blake and Paul Darrow's Avon in the recently released Blake's 7 audio series. 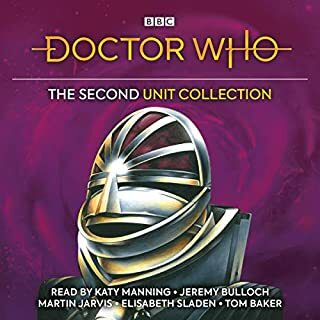 I barely recognized Thomas's voice as Blake when I first heard it and poor Paul Darrow sounds as if his dentures are slipping on the &quot;S&quot; sounds in words. 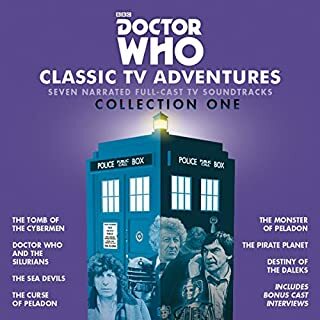 however, Trevor Baxter as Professor Litefoot and Christopher Benjamin as Henry Gordon Jago sound just as they did back in 1977 which helps immerse the listener back into their world as if this series had been produced soon after their appearance on Doctor Who. 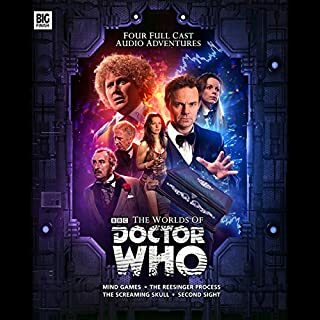 The stories themselves are definitely in the vein and style of a Doctor Who episode of the period so are not darker departures from that style. As such, they are suitable for the younger listener. All stories are entertaining and are fairly light fare and are firmly aimed at the adventure side of the horror genre. 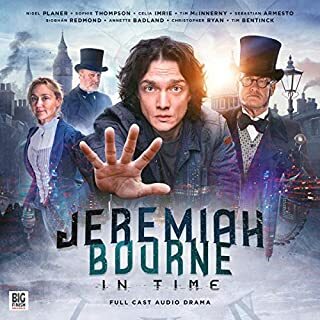 The production quality is excellent with plenty of atmospheric effects to pull you into the narrative set in Victorian London circa 1892 I gather. 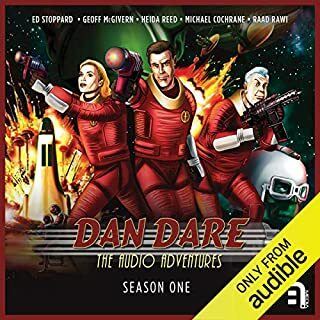 There is an extensive behind the scenes feature at the end which provides interesting insights into the making of this series as well as interviews with all the voice actors and is a quality and worthwhile addition to this book. It's no surprise that Jago and Litefoot are somewhat like the classic Holmes and Watson in their ability to crack weird cases in addition to the very different characters each duo are compared to one another. Holmes is the sophisticated intellectual thinker while from what I know of Watson, he is rather less so but each acts as a foil to the other. 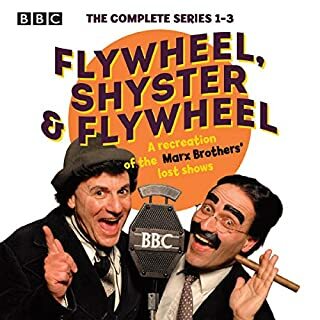 This is similar to the Litefoot and Jago partnership with Jago being the Victorian equivalent of a second hand car salesman while Litefoot is the educated, upper middle class gentlemen who works as a pathologist for the Police and has a logical mind. The opposites of character works well as both men bring something to the table and their partnership is what makes the stories as entertaining as interesting. 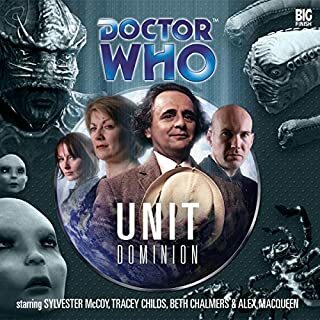 If you haven't seen them in the aforementioned Doctor Who story then it doesn't matter as each story in this series is not dependant on anything to do with that episode. So, if you like the thought of some fairly lightweight mystery and adventure set in the colourful Victorian era then this is a fun way to spend a few hours. This long series from the past (original Dr WHO) is a good old laugh. 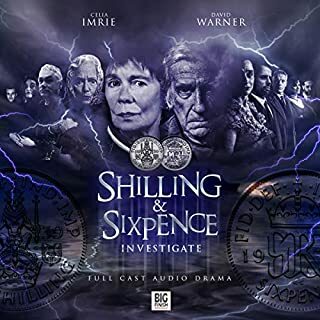 At over 5 hours per series, well worth the credit and at five shows, we have hours of rumbling Victorian fun as they are shifted through one odd dimension to another. Two great British actors make this show : Thank you guys! having been scared stiff by the Tallons of Wing chiang as a kid, I thought I would watch it again for my birthday . 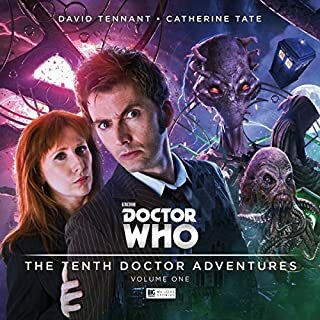 the Gothic victorian setting was superb and avoided some of the some of the rather thread bare special effects present in many of the other doctor who adventures (washing up gloves sprayed silver, in the Robots of death!). the characters of Jago and Lightfoot were really compelling and endearing. 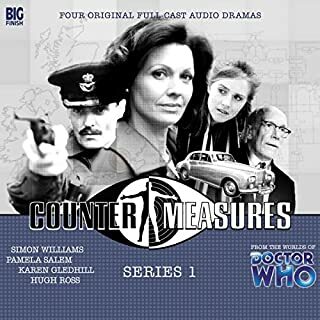 very happy to report that this audio series is a little jem containg superb performances and great stories. 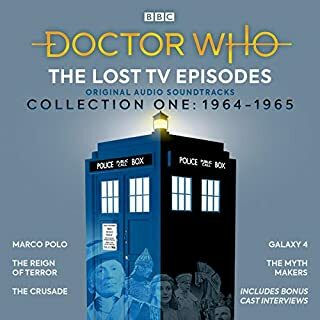 Would you listen to Jago & Litefoot Series 1 again? Why? Fans of the Talons of Weng Chiang will love this. 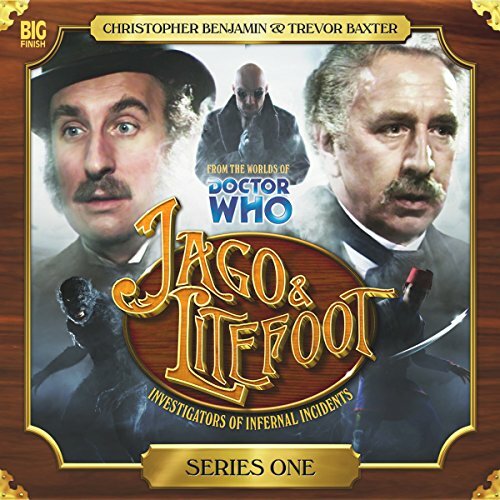 Can't believe it took over forty years for Jago and Litefoot to get their own series, but it is well worth the wait! Well written and well acted. This is a worthy spin off from the world of Doctor Who. I will definitely be purchasing series 2. 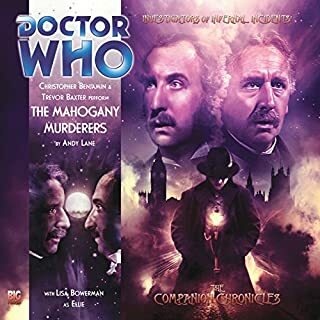 The creative minds at Big Finish hit gold with the first Companion Chronicle starting Christopher Benjamin and Trevor Baxter as the lovable duo of Henry Jago and Professor Lightfoot. To all our delight they took that success and spun off a new series of full cast audio dramas with these two characters at the fore. The style of writing, the stellar performances, and superb post-production effects and music bring to life a Victorian London that you can almost taste and smell. The easy chemistry between Benjamin and Baxter, and the fun the entire cast and crew had in putting these on, truly comes out in their performances. The follow on interviews were an extra bonus, although a bit long, which makes these plays even more enjoyable. I’m looking forward to continuing on to the next series with sheer pleasure. What disappointed you about Jago & Litefoot Series 1? The stories were hard to follow and just plain dull! 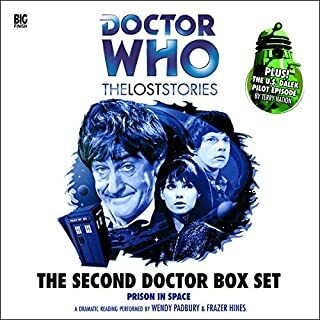 Nonsensical plots, even for a doctor who based story, and poor characters. No, it is very hard to follow this as it is like a play and not a story. If you could play editor, what scene or scenes would you have cut from Jago & Litefoot Series 1? Don't waste your credit. This is the worst series I have ever listened too.